Submitted by Mike Penn on 11 December 2018. This is the third of five "Meet the Scientist" journal entries featuring the members of the intrepid Automatic Weather Station crew. Have you been wondering who is with me here in Antarctica? Have you wondered how these people became scientists and what kind of experience and qualifications they have in order to get here? "Meet the Scientist" should answer those questions and more. Elina Valkonen rappelling into a crevasse. Elina is from Finland and will be 26 years old in a few weeks. Below you will read what she says about herself and her participation with the AWS team. "I’m studying for my Ph.D. at Colorado University-Boulder in the Department of Atmospheric and Oceanic Sciences. I study storms over the Arctic Ocean, how they interact with the sea ice and ocean surfaces. I’m originally from Finland, where I got my Bachelor of Science and Master of Science degrees in Meteorology from the University of Helsinki in Finland. I was always good at math and sciences, and got accepted to the physics program at the University Helsinki and meteorology was one of the choices for my major. I also have to admit that until college I was never super fascinated by physics, I was okay in it, but honestly felt it lacked the connection to real world (in high school, all you do is calculate how much force is required for a ball to roll down a steep hill… at least that’s how I felt, hahahah). I just liked physics more than chemistry. But then I got to the meteorology courses and the more I studied meteorology the more I got fascinated by the field and how these massive weather systems interact. And now I’m totally sold, never too tired to talk about clouds or storms or precipitation. In polar meteorology specifically, the unresolved issues and small improvements that can then lead to more accurate forecasts and climate analyses pique my interest. So, to put it more simply, what fascinates me about polar meteorology and climatology is the fact that there is still a lot to be found in this subfield, which is not the case with all subfields. Not to claim that our theories would be perfect by any means, but in many instances, we do know enough to have accurate forecasts, whereas in the polar regions, that is not always the case due to lack of observations and understanding." 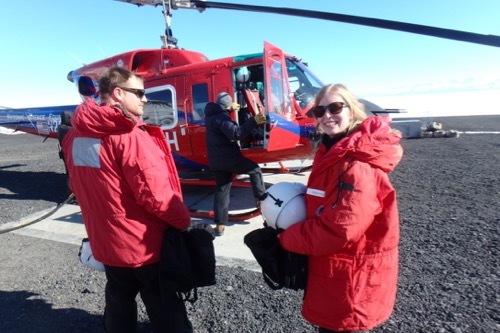 Elina Valkonen and the AWS team prepares to fly in a helicopter to Laurie II AWS on the Ross Ice Shelf. "I was fortunate to have the opportunity to work as a research assistant alongside my studies at the Finnish Meteorological Institute and learned a lot! Through that work, I got the idea to take a course from the University Centre in Svalbard, which offers amazing fieldwork courses in a variety of polar fields. The course taught me that I love fieldwork! It also introduced me to a bunch of great people from my field, both students and professors, including my current advisor from Colorado University-Boulder. I also noticed that even though living in a foreign country (the United States) seemed exciting and intimidating at the same time, in reality, it is just like normal life back home. Especially with fast internet connections and "Whatsapp", it’s easy to keep in touch with friends and family at home. And this was the final push I needed to decide to do my Ph.D. studies in the United States. I’ve always loved to travel and played with the idea of studying abroad and meeting other people who were doing their Ph.D. studies abroad, I realized that "Hey I can do that also!" And it has been one of the best decisions of my life!" AWS team members Elina Valkonen and Dave Mikolajczyk rappelling into a crevasse. 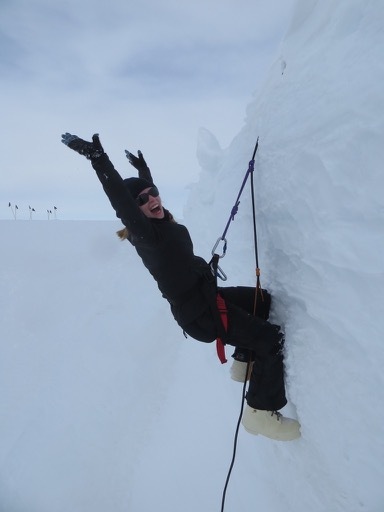 "My advisor collaborates with the AWS group and that is how I ended up getting a chance to come to Antarctica. It’s been totally amazing so far! So I would say that my path here has been partly planned, and partly a series of rushed decisions and lucky coincidences, but I’m very happy and fortunate to be able to do what I am doing here. On my free time, I love to dance (mostly ballet or jazz), watch movies (binge-watching old Disney classics is always a good way to spend the evening), run and hike (hoping one day to reach my first 14’er). " 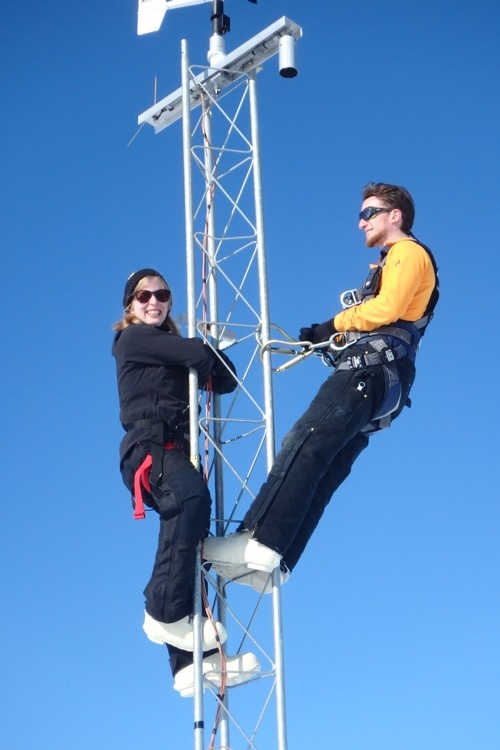 AWS team members Elina Valkonen and Dave Mikolajczyk installing instruments on an AWS on the Ross Ice Shelf in Antarctica. Mariah, There are five of us on the AWS team. But it is just Lee Wellhouse and me here at the South Pole. There are about 100 other people here at the South Pole either as support staff or Science people like me and Lee. Are the crevasse's cool to look into. Adrianna, We've tried to stay as far away from any crevasses as we possibly can! They are too dangerous to take lightly. 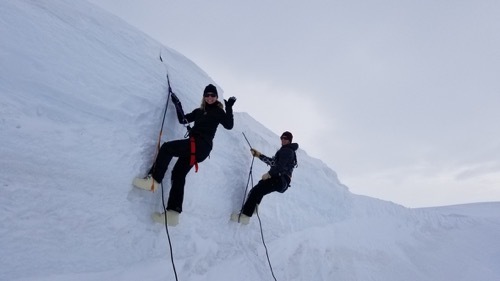 The pictures taken of Dave and Elina were of training for getting out of, or rescuing someone from a crevasse and was under very controlled circumstances with very stable ice! Safety First!